Learn how to travel the world while living the life of a digital nomad. Want to write for us or contribute a guest post? Become a digital nomad in Chiang Mai, Thailand. *Disclaimer – This post contains affiliate links, however the opinions are my own. I have been wanting to write this post for a very long time. People rave about Chiang Mai being one of the destinations for digital nomads to base themselves. And to be honest, it is hard to argue with the quality of the infrastructure, as well as the prices for the cost of living. If you are an entrepreneur and you need a base that will allow you to grow, the Chiang Mai is definitely one of the best options to consider. In this post, we will share the benefits of living in Chiang Mai and how you can pursue a life as a digital nomad in the city. Before I jump into the article, let me tell you why I find Chiang Mai so attractive. The main reason is the quality of life that you can obtain. You have access to the cultural experience, which is great if you are someone that likes to travel. You can use currency arbitrage to have greater purchasing power in Chiang Mai. This means you can get more luxurious accommodation, food and experiences. And thirdly, the city has an infrastructure similar to other developed countries. The internet connection especially rivals the connectivity speeds of other European, American and Asian countries. One of the most attractive things about staying in Chiang Mai is the quality of the accommodation and the cost. You can rent a room for as little as $200 a month or a studio apartment in a condominium for as little as $700 a month. You will need to decide in advance what kind of lifestyle you want. You can get accommodation in a condominium, which will have a pool and a gym and can save you spending extra money. You will also want to be aware of the security that the accommodation offers. Ideally, the building will come with staffed security and that the location is known to be safe. Note – Something that you will need to keep in mind is that Thai’s tend to sleep on hard mattresses. So if you don’t think you will be comfortable sleeping on a hard mattress, get in touch with the accommodation host in advance or visit the property before you commit to the booking. I would personally avoid booking accommodation for a long period of time without checking the accommodation in advance. Below are useful resources to help you find accommodation in Chiang Mai. There are numerous hostels in the Old City. Below are a few affordable ones that you can stay in. Shared rooms of 4 people start from $15 a night. This place has really good reviews. It is modern and clean. There are Wi-Fi in the rooms and there is a complimentary breakfast. Click here to make a booking. This hostel has very good reviews and only costs $13 a night for a shared dormitory. Good breakfast, clean, wi-fi and free bike hire. Another popular hostel with mixed dormitories. Book a bed from $9 a night. Great value for money and many positive reviews. Shared dormitories start from $9 a night. Upgrade to $11 to get the free breakfast. Rated as “Exceptional”, it’s another great place to stay from only $9 a night. If you want something cheap and cheerful, go with this place. Beds start from $4 a night. Prices start from $20 a night for a twin room booking. The hotel is also located inside a shopping centre. Price – 5000 Baht/month with an onsite gym, pool, electricity and water. Price – From 8,500 Baht/month for a studio with an ensuite. This doesn’t include electricity and water. Useful links for finding accommodation in Chiang Mai. One of the things that makes Chiang Mai very attractive for digital nomads is the internet availability and connectivity. Check the connectivity at your accommodation. If you use multiple devices, see if you can use multiple connections at the same time. You can buy and register for a mobile sim card while you are in Chiang Mai and use your phone as an internet hotspot device. The average internet speed in the city is 30mB per second, which is a sufficient speed for online businesses. Note – It’s recommended that you also purchase a spare power bank pack in case the power runs low on the devices that you are using. Below are a few power pack options that you can consider buying during your travels. There are a few visa options when it comes to staying in Thailand as a digital nomad. I strongly advise that you visit the Thai Immigration website and follow the visa rules for staying in the Kingdom of Thailand. You can see details on the Thai immigration website. If you have any questions, you can also ask questions in this Facebook group about Thai immigration. Their members are well informed about the visa process and can give you the necessary guidance. Also, check with the Thai immigration office or consulate in your country of residence. You can also use visit this forum to see frequently asked questions in regards to Thai immigration. Eating out in Thailand can be inexpensive if you stick to eating the local food. The price of food at restaurants are slightly cheaper than in Western countries. Use TripAdvisor’s restaurant app to get a good idea about recommended restaurants or places to eat in your area. Below are a couple of videos that can give you a good idea about food in Chiang Mai. One of the things that really appeals to me with Chiang Mai is the cost of travel within Thailand and also to neighbouring countries. Thailand sits on the border with Laos, Myanmar and Malaysia. The city also boasts an international airport, with several flights available to all parts of the world. You can use flight comparison sites. Also check for deals with Air Asia. However, a cheaper way to travel is by bus. So you can actually buy tickets and crossover the border and explore the different countries fairly inexpensively. You can actually download the car-sharing app Grab, which works similar to Uber but is meant to be cheaper. There’s also an intercity train service. You can get detailed information on Seat 61. You are at a huge advantage due to the currency strength against the Thai Baht. You will ideally want to earn in a strong currency such as the US dollar, British Pound or The Euro. You can get by on $1000USD per month. However, you would be more comfortable earning $2000 USD a month or more. There are a few co-working spaces you can use that are fairly inexpensive and that have a good internet speed. Address: 5th Floor, MAYA lifestyle shopping centre. Address: 164/9 Moo 6 Faham , Mueng, Chiang Mai, 50000, Thailand. You can see more information on their Facebook page. 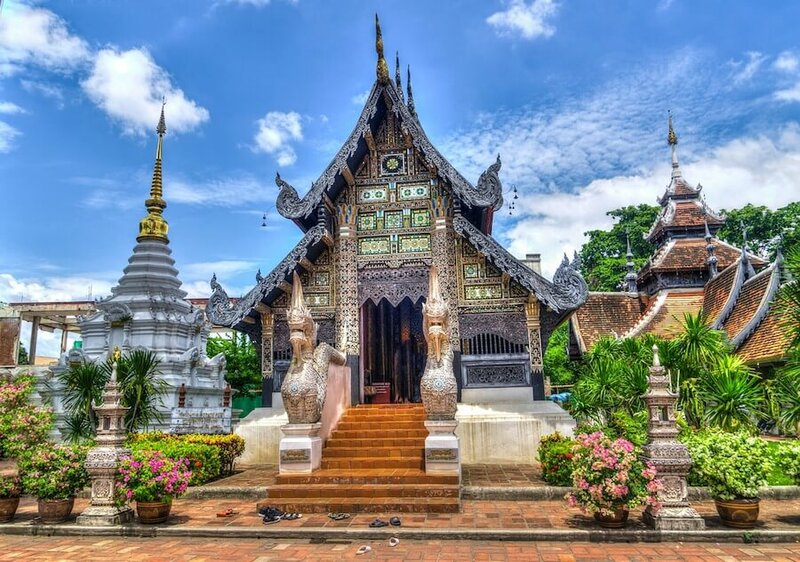 Things to do in Chiang Mai. There are many things that you can do to enjoy Chiang Mai. To be honest, we recommend the information using the links below since they are very exhaustive and will give you alot more insight into things to do in and around Chiang Mai. This guide should help you get started as a digital nomad. If you have any thoughts or questions, please share them in the comments below.